A picture is worth 1,000 words. As a writer who does not have very good photography skills, I usually end up looking at photos I’ve taken and couldn’t tell you in 1,000 words what I was trying to get a picture of. This photo of my grandfather and me, however, could very well be worth a million words. I’ve looked at it hundreds of times and it still tugs at my heart. I found it in an old family album. It’s actually the second picture of a pair. 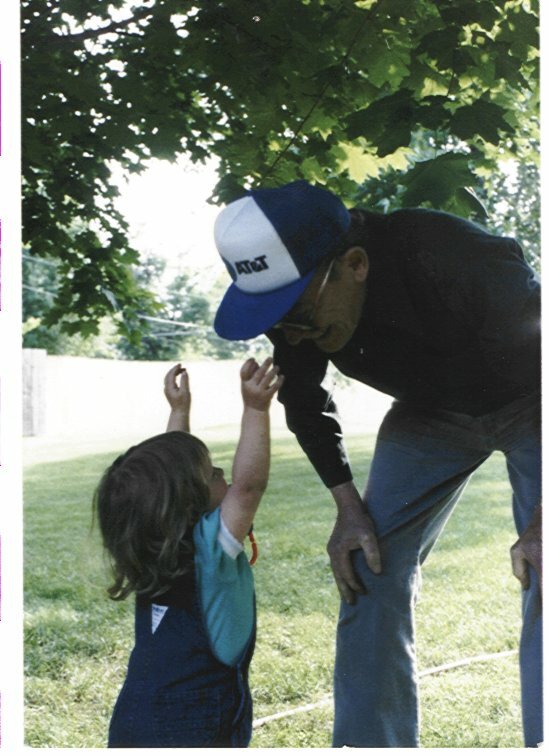 In the first, my mother took a snapshot of Granddaddy and me as we walked through the yard, my tiny steps hurrying to keep up with his long-legged walk. We stopped, and in my quest for affection, I reached up for a hug. You can see his smile in the picture. He was teasing me, you see. According to my mother, he let me stand there with my arms up, waiting for the hug I knew would come. Though a loving father and grandfather, Granddaddy had a sense of humor that this picture captured so well. Even though he made me wait, I must have known that he would hug me eventually. My friend’s words could not be more true. How often in the past few weeks or months have I must looked much like I did back then, arms reaching up, begging for attention, affection, comfort. My favorite account about Jesus and His time on earth was the woman with the issue of blood who bled for 12 years. She knew that if she just touched the hem of His garment, she would be healed. How many times have I yearned just to have that ability. Just to grasp the edge of His clothes for a tiny particle of His almighty power. Even though Jesus no longer lives on earth bodily, He is still closer to us than a brother (or a grandfather). Like Adam in the garden, Christ still wants to walk with us — just like that sunshiny, summer day in 1980-something, when life revolved around my grandfather and me and our time together. About ten years after that photo was taken, Granddaddy died. In his final days in the hospital, he could barely talk, exhausted from hanging on to life. One day, though, in his weak, failing voice, he started to sing. Granddaddy was reaching out his arms, waiting for God to bend down and carry him home. Outstanding, Olive. One of your best, and they’re all good.